William Yeatman, Sr., keeper of the light from 1871 - 1908. Mr. Yeatman has been described as a man of small stature with a long beard. The buoy shed and fog bell (currently located in St. Michaels MD) are visible in the background. 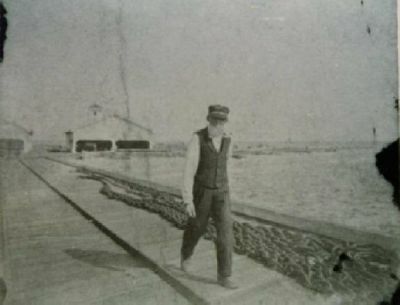 Notice what appears to be a large chain on the dock behind Mr. Yeatman. Date unknown, probably the early 1900s. Photo courtesy of Barbara Quasny.